Getting consistent blogging from your in-house team is challenging. Over 5 years we've tried many things– I've laid out the good and bad in this article. For many years, I struggled with how to build equity in our brand and website. I came to realize, there is no single solution. It’s a series of many small victories that lead to better performance and increased organic traffic. After all, building website equity through content marketing and SEO is a marathon, not a sprint. Traffic to our blog was pretty flat, and since I wanted to build equity in our website, one way to do that was a consistent stream of valuable content. My plan was simple… develop a content strategy and an editorial schedule and get my team to start writing. Not so fast. Initially, the team wasn’t as excited about the idea as I was. We all struggled to find time to write for the company blog. Some questioned the value of blogging and others dreaded the idea to the level of writing a high school thesis paper. How does a small business keep employees motivated and writing consistently when everyone’s so busy? For all of you out there who want to create more content and are relying on your current in-house team to do it, here are some strategies we’ve used to improve our output over the last five years. Along with sharing our successful blogging tips, I’ve made sure to include attempts that failed as well. Blogging Tip #1: Commit to content creation starting with the leadership. Promote your team and their content, and they will see you are invested. We made a commitment to creating more and better content in 2010. It started with the owners who took the lead and started writing more. We also focused on our employees’ personal brands and promoted their writing in company emails, social media posts, etc. It didn’t take long before our employees started getting attention from our network and people in the design and marketing communities. Blogging Tip #2: Develop a process for engineering the content your team is developing, or your efforts will go unnoticed. We learned how to engineer content and started applying our knowledge in 2011. We began engineering each article based on keyword data. Here’s an example of our approach at that time – How To Blog Your Way To More Search Traffic. Was it successful? Not very. 126 total pageviews since 2011. We had the right idea, but our blog had very little reach back then and no PR or link-building efforts behind it. Now, some of our most popular evergreen blogs get over 100 page views a day, even a year or more after being published. 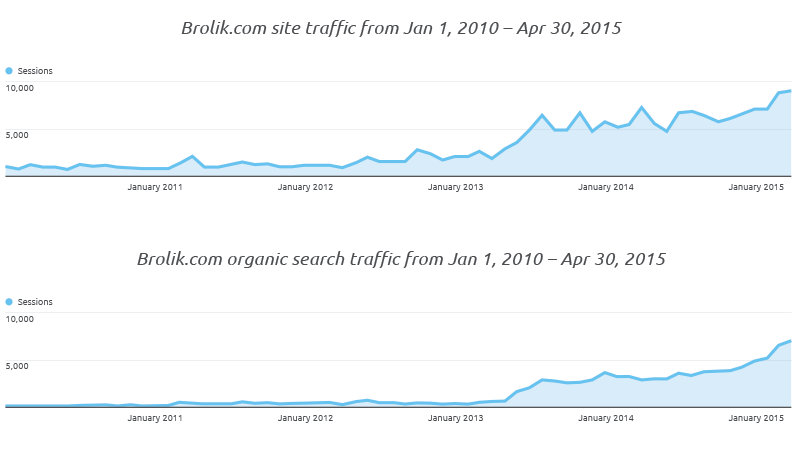 This traffic is predominantly coming from organic search. The key with these successful blogs is understanding what information people are looking for and the terminology they use to search for it. Make sure an audience exists in the first place. Start with topic suggestions (Ubersuggest) and optimize around high volume, low competition keywords as you go (Google Keyword Planner). Blogging Tip #3: Create an editorial calendar to guide you, even if it’s a simple spreadsheet. Your team will take the blogging efforts more seriously with a structure in place. In 2012 we created an editorial calendar and a process. We gave each employee deadlines for topic submission, rough draft and final draft. We kept track of their deadlines and followed up with them occasionally if they fell behind. Our output increased with a system in place. Our efforts started to pay off. We were seeing substantially more traffic coming to our blog in 2013 than in previous years and organic search traffic overtook all other traffic sources. The growth was exciting, but we weren’t satisfied. We knew we could publish a blog per week minimum with a team that had grown to 14. There were stretches of 3-4 weeks where no one published. When people got busy with client work, we couldn’t exactly tell them to miss a client deadline to write a blog. There was no clear answer to getting the team to write more without making it mandatory, which would negatively affect writing quality. We thought incentivizing our team could work. Blogging Tip #4: Make sure your incentives are valuable to your employees. In 2013, we awarded a half day vacation time to anyone who achieved 250 shares on their blog. We thought this would be a great incentive, but our plan didn’t work. No one ever used their half day. Our vacation policy is pretty flexible to begin with and our employees didn’t need an excuse to take an extra half day if needed, so the reward was of little value. If you are going to incentivize your employees, make sure the rewards are valuable to them. Blogging Tip #5: Make sure you understand your goals. Personal development, organic traffic and lead generation are all completely different goals and require a different approach. In 2014, we tried some new formats. We tried a team-wide prompt and published all of the answers. This improved participation dramatically. Every employee at Brolik wrote their own version of My Breakthrough of 2014 without much prodding at all. It was a solid exercise for everyone but it was miserable in terms of organic traffic. The exercise was more about self-reflection and expression and less about engineering content. Blogging Tip #6: Don’t expect your work to go viral just because you have a big name attached. We also tried a roundtable approach. We reached out to respected marketers, including the CMO of GE, a startup founder, and a marketing manager of a not-for-profit. We got a few tweets and shares from our roundtable participants, but not much traction otherwise. It took a lot of logistical work and coordination and didn’t return the value we expected. Blogging Tip #7: Direct communication, not group email. Participation fell off in the summer of 2014, and so we sent blog deadlines out at the bottom of a weekly email to the team. It got lost on most of the staff. Without direct communication about deadlines and re-emphasizing the value in an in-person setting, the group email didn’t help to motivate. We used the data from the survey to make some changes including adding a cash incentive and developing a new structure and plan. Blogging Tip #8: It’s not about the money. It’s about personal growth and positive results. We created a $100 bonus for every blog published. I don’t think anyone really cared about the $100, even though they said they did. We thought $100, as small as it is, would get people over the hump. I don’t think it made a bit of difference. Having a successful blog is a better reward than a vacation day or a cash bonus. Blogging Tip #9: Don’t waste your time trying to drag along employees who don’t want to write. Keep moving with the ones who do. We made participation optional. Employees opted in and were added to a structured calendar. If you opted in you were expected to participate and hit deadlines. If you decided not to participate, you weren’t asked or expected to do anything. This seems to work (but we’re still testing this). Blogging Tip #10: It all comes down to company leadership, setting the example and holding people accountable. Invest the time with every person on your team if you expect them to be invested as well. I personally started meeting 1-on-1 with each member of the team for a blog brainstorm to help them come up with topics to write about. This is one of the best decisions I’ve made in a while. It gives me a chance to work with every member of the team individually, which I don’t often get to do. It’s rewarding for me, and it’s helping our team think through their ideas. Each team member leaves with a great idea for a topic and some momentum, and based on our previous survey responses, coming up with a topic and getting started was the biggest hurdle. Just because your team knows content creation is important doesn’t mean they are going to do it. Everyone needs to be held accountable. Everyone needs to be inspired and guided at times. Small cash incentives don’t work. There needs to be an overarching strategy and consistent guidance for your team to get results. Finding time will never be easy. It’s important to share positive results with the team. We’re still growing our company of content creators. We’ve come a long way since 2010, and we’ll continue to learn and improve as we go. 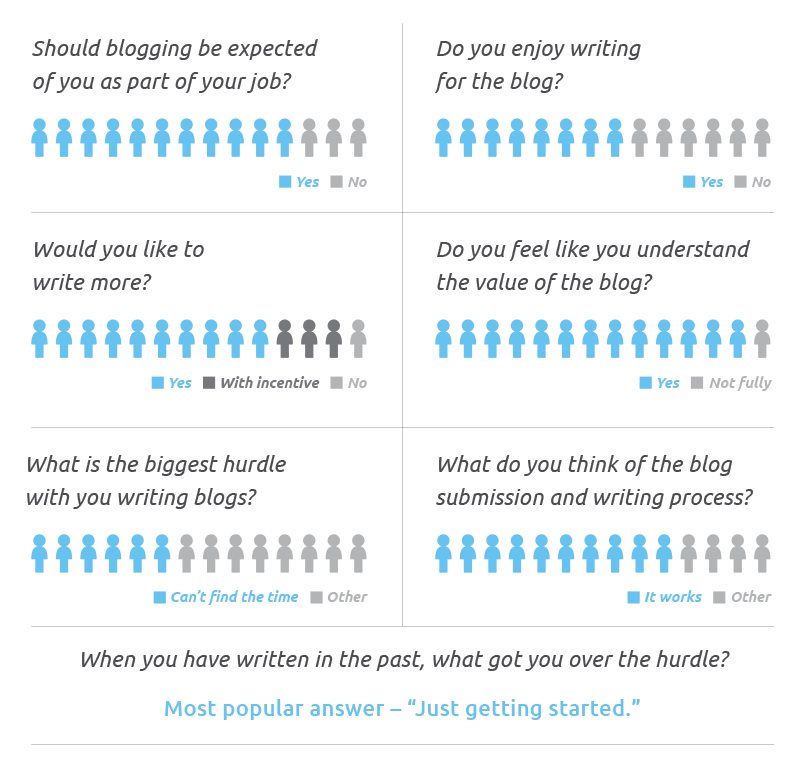 Do you have any additional team blogging tips? What has worked for your team or business? Please share.